King Arthur, Knights of the Round Table, beautiful show girls, cows, killer rabbits and French people? It must be Spamalot! Lovingly ‘liberated’ from the classic Monty Python and the Holy Grail and winner of three Tony Awards including Best Musical (take THAT, Cats! 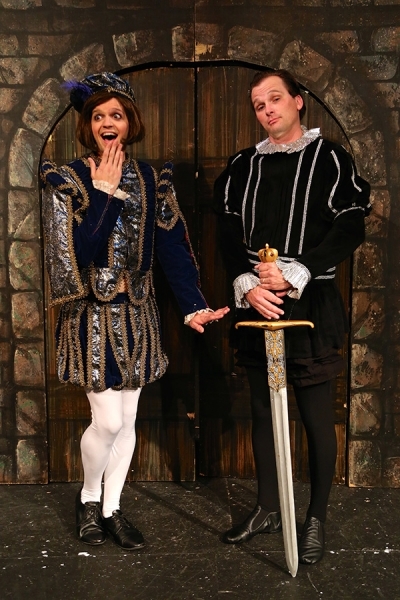 ), Spamalot will have you laughing your coconuts off as you gallop along with this larger-than-life production! Coronado Playhouse is hosting 24 local actors, a massive set and (very expensive) music tracks – we couldn’t afford the orchestra. In order to help us meet our production goals, we ask you to join our production efforts by making a tax-deductible donation. You will be rewarded with gifts ranging from show tickets, admission to our special events, acknowledgment in our souvenir program and Playhouse membership. Coronado Playhouse, a 501(c)(3) non-profit organization, is committed to improving our productions year after year, while providing the community with accessible theatre. With Spamalot, we are upping the ante and bringing you the best local creative team available. And, we need your help! See our Spamalot Sponsor Letter to see how you can help. Please option-click or right-click to open thumbnail in new window. Manny Bejarano (Ensemble) is excited to be back at the Coronado Playhouse and part of this great production. He was last seen in 9 to 5, Pageant, Grease, The Drowsy Chaperone, Into The Woods and The It Girl. Kyle Casser (Ensemble) graduated from the University of Delaware with a degree in English Drama and minors in Theatre and Dance and has studied at The Broadway Dance Center in NYC. She was most recently seen in Flat Seven’s production of Sheila: A Rock Musical at the OB Playhouse. Kyle could not be more excited to join the wonderful cast and production team here at the Coronado Playhouse and to be a part of this amazingly fun and spectacular show! Daryl Daley (Ensemble) SPONSORED BY NORM AND DARLENE DALEY is happy to be back on the Coronado Playhouse stage after appearing as Princess Beauty in Sleeping Beauty or the Famous Rose Taboo and Mary Sunshine in Chicago earlier this season. Other appearances at CPH include The Best Little Whorehouse in Texas (2012) and The Drowsy Chaperone (2011). Elsewhere: Grease (OnStage Playhouse) and Zombie Prom (Pickwick Players). Thomas Fitzpatrick (Ensemble) SPONSORED BY BARRON HENZEL is making his Coronado Playhouse acting debut. Tom directed CPH’s Sleeping Beauty…, TBLWIT, The Drowsy Chaperone, Cinderella and The It Girl. He has performed at Diversionary, Lyceum, Avo Playhouse, The Broadway, SD Lyric Opera, as well as performed and directed with Pickwick, OnStage and Lamplighters. Past roles include: Reuben (Joseph…! ), Charlie Brown (Snoopy!!! ), Julian Marsh (42nd Street), Ernst Ludwig (Cabaret). Next, Tom directs A Year with Frog and Toad (CPH/Pickwick co-production). Love to F & F! Steven Jensen (King Arthur) started performing plays during the Carter Administration. He is pleased to be not yet dead — and back for a tenth CPH show. Plays here included The Drowsy Chaperone, 42nd Street, The Importance of Being Earnest, The Best Little Whorehouse in Texas, The Man Who Came To Dinner, and Romeo and Juliet. Many shows elsewhere: Lyric Opera SD, Vanguard, New Village Arts, Diversionary, Poor Players, Lamplighters, OnStage Playhouse, Teatro Máscara Mágica, and others. Patrick Mayuyu (Ensemble) is delighted to be back for his fifth show at CPH. He was last seen in The MENding Monologues at the San Diego International Fringe Festival (Award for Outstanding Testimony – Ensemble). An actor, singer, dancer, director, choreographer and writer, Patrick has been seen on several local stages including ion theatre, San Diego REP, Diversionary, SD Asian American Rep, and OnStage. He thanks his friends and family for their never-ending love and support. Loraine Odierno (Ensemble) is honored to be performing alongside many of her fellow Alumni. Favorite past roles include Audrey in Little Shop of Horrors, Frenchy in Grease and Penny in Hairspray. Special thanks to Jennie and the entire cast and crew for all of their hard work. Extra special thanks to Lady Edie, Sir Jacob, Sir AJ and Sir Tom for their patience, love and support! Wishing all of our audiences great success in finding their Grails! Jovi Olivas (Ensemble) could not wait to return to Coronado Playhouse after her debut here, playing Beatrice in The Best Little Whorehouse in Texas. Jovi has been acting professionally since she was fifteen, landing a speaking role on television, and performing in numerous stage productions around town. She also is a front woman of a goth-electronic band called Zombie Barbie. She looks forward to playing with great talents in this production, as she is an Anglophile through and through! Eric Olson (Sir Dennis Galahad, The Black Knight, Herbert’s Father) was last seen at Coronado as Sid Prince in Sherlock Holmes: The Final Adventure. Recent appearances: A Midsummer Night’s Dream (Pickwick Players), The Big Break (San Diego International Fringe Festival) and Once Upon A Wedding (Escondido California Center for the Arts). An actor and writer, he has appeared in commercials, short films and onstage throughout Southern California and his plays have been produced in San Diego, Palm Springs and Orlando, FL. M.G. Perez (Ensemble) found his way to Coronado Playhouse in 2012 when he was cast in The Best Little Whorehouse in Texas. He has a wide range of theatre experience including roles in Carnival!, The Laramie Project, Much Ado About Nothing, Cat On a Hot Tin Roof, Corpus Christi and Big River. M.G. was recently elected vice president of the CPH Board of Directors and continues his service to the Playhouse as Media Coordinator for all our productions. He has a master’s degree in special education and teaches children with disabilities across the mild to severe spectrum. Roxie Peters (Ensemble) has been in and choreographed shows in both WA and CA, most recently including Little Shop of Horrors, Grease, and Happy Days: The Musical. She has been dancing in a variety of styles for 14 years and has always wanted to be more involved in singing and acting. She thanks her family, friends, dance teachers, and Karyn Overstreet for their support and knowledge. Also, big thanks to cast and crew for being great and hilarious. Frank F. Remiatte (Sir Bedevere, Dennis’ Mother, Concorde) SPONSORED BY MICHAEL WASINSKI is thrilled to be back at the Coronado Playhouse working with this amazing cast, production team and his BFF Debbie! Past Coronado Playhouse shows include Pageant the Musical and Cinderella. Other San Diego credits include; 9 to 5 The Musical, To Gillian on her 37th Birthday, Martini’s N’ Mistletoe, Incorruptible, and the list goes on. Frank is a multiple Aubrey Award winner! As always, Love & Thanks to my one and only! Robert Shadbolt (Ensemble) is happy to be back at the Coronado Playhouse working with a talented cast and production team. He recently played Flute in Pickwick Players production of A Midsummer Night’s Dream. Other favorite roles include Orville in Daddy’s Dyin, Who’s Got the Will?, Jumbo in Panache and Cheswick in One Flew Over the Cuckoo’s Nest. A special thanks to the Yellerson family for their love and support. Todd Sutton (Ensemble) is happy to be back on stage, after a 30 year hiatus, performing in his favorite musical. In the previous century he was the Scarecrow in Wizard of Oz, Corporal Billy Jester in Little Mary Sunshine and a bevy of bits inbetween at SDJT and SCPA. He is an electrical engineer by trade and a quarter Jewish on his mother’s side. Thank you Sarah for playing piano at my audition and your support! Michael Van Allen (Sir Robin, Guard 1, Brother Maynard) is thrilled to be returning to The Coronado Playhouse stage and working with such a fantastic cast, crew and production team! He has previously performed with The Coronado Playhouse in The Drowsy Chaperone (Feldzieg) and The Best Little Whorehouse in Texas (Melvin P. Thorpe). Other San Diego theatre credits include Bye Bye Birdie (Mr. MacAfee), Zombie Prom (Eddie), and Little Shop of Horrors (Mushnik) all with Pickwick Players. 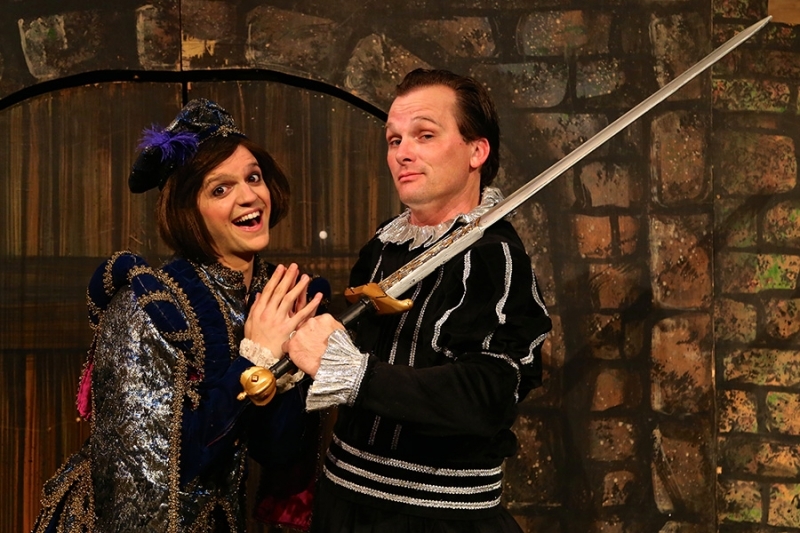 Cameron Williams (Sir Lancelot, The French Taunter, Knight of Ni, Tim the Enchanter) SPONSORED BY Alisa and Bryn Williams is honored to appear in his second Coronado Playhouse production, having recently portrayed the King in Sleeping Beauty. He is Artistic Director at Pickwick Players where he has performed the roles of Albert Peterson in Bye Bye Birdie and Linus in Snoopy!!! Cameron thanks Madame Quinn for allowing him the opportunity to develop his accent during French class many years ago, and also Alisa and Bryn for their constant love and support. Jim Williams (Mayor, Patsy) was last seen at CPH as The Drowsy Chaperone’s Man in the Chair. Jim enthusiastically returns to appear with son Cameron and many new and old theatre friends. A veteran of dozens of shows, some favorites include Drowsy, Greater Tuna, Fiddler, Something’s Afoot! and Two by Two. Retired after 41 years teaching, Jim travels extensively with wife Merrie, harvests a mean veggie garden, and enjoys his family. He loves playing quirky characters and hopes to do more. Kylie Young (Ensemble) has always had a passion for performing. She has been dancing and singing since she was a small child. Some of her favorite roles include Ariel in Footloose, a dancer in Spamalot, and Rona in The 25th Annual Putnum County Spelling Bee. She would like to thank her friends and family for supporting her in all of her performing endeavors! Jennie Gray Connard (Director/Co-Choreographer) is thrilled to be back at CPH directing and choreographing for a second time. She has performed in several productions at CPH dating back to 1989, and has been directing since the age of seven. Jennie wants it to be known that this cast was an absolute dream to direct and choreograph, and made this entire process a joyous event to behold. Extra special gratitude goes to Kirk and Meredith for all of their talent and creativity and to Bill, Barron and especially Kyle, her (adorable) right hand, for keeping everything on track and understanding the vision and passion of the director. Welcome back, Todd! Kirk Valles (Musical Director) teaches Vocal/General music in the San Diego Unified School District and is Director of Music at St. Mark’s Episcopal Church. Closer Than Ever, Little Shop of Horrors, The Best Little Whorehouse in Texas, 25th Annual Putnam County Spelling Bee, Pippin and Sleeping Beauty include some of Kirk’s latest shows. Kirk also maintains private piano and voice coaching in the San Diego area. 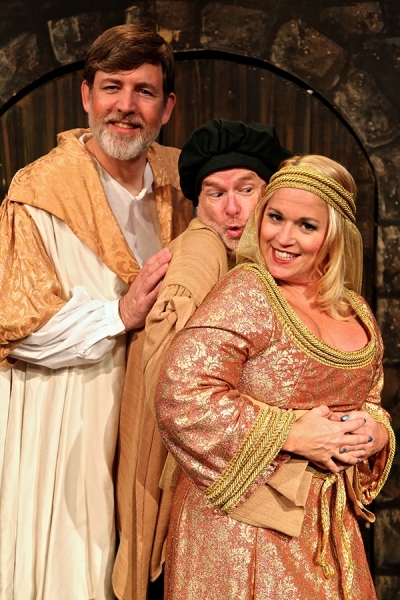 Kirk is honored to be working with The Coronado Playhouse and the talented cast and production team of Spamalot. Much LOVE to Ana, Brooke and Garner. Meredith Russo (Co-Choreographer) is delighted to work with Jennie in choreographing Spamalot. Normally seen on stage, it’s a thrill for her to be behind the scenes for a change. Previous choreography credits include The Secret Garden at Patio Playhouse and The Wizard of Oz at Pacific Children’s Theater. Special thanks to the wonderful cast and production team! Bill Connard (Co-Producer) is overly impressed by and excited to be working with some of the most talented and professional performers in the San Diego area. A good production team knows that it’s the actors that make the show. He is confident that this dream team, with his lovely wife directing, will deliver the highest quality and most genuinely authentic version of Spamalot that a community theatre could deliver. He has produced two shows and built countless sets for CPH and in real life is an entrepreneur and the VP of local search solutions for Rio SEO. Josh Olmstead (Lighting Design) This is Josh’s fourth lighting project at Coronado Playhouse in a career that began less than a year ago. Starting as a lighting operator for Chicago and then Sherlock, he entered the world of lighting design for Sleeping Beauty. Now, Spamalot is his biggest challenge and thrill yet. He would like to thank all of those who have taught him here and offered their time, knowledge, and skill to make this an amazing community to be a member of. Richard Anthony (Sound Design) is a recent transplant to San Diego, having having spent seven years in theatre production with companies in West Virginia, Virginia, and Maryland. His favorite productions have been designing sound for Jesus Christ Superstar and Play It Again, Sam as well as acting in Proof, Noises Off, and The Boys Next Door. Special thanks to Jennie and everyone at CPH for making him feel welcome! He looks forward to many more productions with you all! Pamela Stompoly-Ericson (Costume Design) is quite happy to be back with Coronado Playhouse for the second time. She was resident costume designer/ make-up artist for Lyric Opera, and is still principal make-up artist with San Diego Opera. Pam also free-lances as a costume designer/m-u artist/instructor at La Jolla Playhouse, Lyric Pacific, TMTC, Southeast Community Theatre, Moonlight and Lamplighters, which starts up again next season!. Pam would like to thank Mom, Eva, Paul and Ric for all their help!!! Kathy Parks (Stage Manager) has always looked on the bright side of life, and is thrilled to be working with such a great cast and crew. She is grateful she isn’t dead yet and thanks Jennie and Kyle for trusting her with this opportunity, and Sassy Sam for being her mentor. She also thanks her fabulous sons Sean Paul and Connor Boyd for allowing her to join them in this crazy theatrical world. Dale Goodman (Ensemble, Stagehand) has been an active theatre technician since 1990. Dale’s credits include extra work in local motion pictures, acting, lighting, set and sound design for numerous shows at Coronado Playhouse; as well as a 2013 Aubrey for lighting design SUDS, a 2008 Aubrey for lighting design for Blithe Spirit, and a 1998 Aubrey for technical direction of I Hate Hamlet. Dale has also volunteered at the Hahn, Sweetooth, and Casa del Prado. Dale’s wife Betty provides a helping hand with lights, and much moral support for the Coronado Playhouse. Patty Fay (Ensemble, Props, Stagehand) has been a technical performer and choreographer for over 50 years with 52 shows at CPH. She is directing a play Nashama for the North Park Playwrights Festival. She recently was the Props Mistress for The Final Adventures of Sherlock Holmes, and was in the ensemble for Carnival! (Aubrey Nomination). She has been in many award-winning ensembles. She was inducted into the Haunted Hotel of Fame after 19 years of service. Patty won the Jim Peyton Spirit of Community Award in 2012. She is thrilled to be working with Jennie and this talented cast in this campy over-the-top production! Join us for a special buffet dinner and a show for only $50 per person. Coronado’s Consummate Catering is providing the meal at the Playhouse from 6:30-7:30pm. Show starts at 8pm. Drink specials at 7pm, a costume contest with prizes at intermission, a raffle, and party with the cast after the show. Only $35 to see the show and enjoy a Halloween night of festivities. Show starts at 8pm. Only $37 per person for show admission, appetizers and drink specials. In honor of Dia de Los Muertos. Show starts at 8pm. Join us for OUT NIGHT for theatre lovers in the LGBT community. Only $25! The pre-show mixer includes complimentary beer and wine, cocktail specials and show admission! Show starts at 8pm. A cameo appearance, backstage SPAMALOT experience and photos of your special night*. Includes a ticket to the show, a cameo appearance, backstage SPAMALOT experience, a membership to Coronado Playhouse, and photos of your special night*. Contact the box office to schedule your special night in Camelot. Limited availability! Proceeds go to the Spamalot production fund. For this production, please help support our partnership with the San Diego Food Bank. During the six week run of performances, Coronado Playhouse, the Community’s Theatre, is raising awareness and conducting a fall food drive to benefit the Jacobs & Kushman San Diego Food Bank. This season, our community partnerships continue the commitment to help those in need. In San Diego County, 446,000 people live in poverty and face the threat of hunger every day. Nearly a third of this number are children. Audiences are invited to write a check or contribute canned foods including tuna, soups, fruits and vegetables, dry cereal, rice, beans and of course cans of SPAM precooked meat in homage to our show! There is also an online virtual food donation option. Go to www.sandiegofoodbank.org for details and more information on how to help. The morning of Thursday October 23rd, a team of Spamalot cast and crew members will volunteer at food bank headquarters to help process and distribute donations.